↑ McKay, John P.; Hill, Bennett D.; Buckler, John; Ebrey, Patricia Buckley; Beck, Roger B.; Crowston, Clare Haru; Wiesner-Hanks, Merry E. A History of World Societies: From 1775 to Present . Eighth edition. Volume C – From 1775 to the Present. (2009). Bedford/St. Martin's: Boston/New York. ISBN 978-0-312-68298-9. ISBN 0-312-68298-0. "Meanwhile, Gandhi was searching for a spiritual theory of social action. He studied Hindu and Christian teachings, and gradually developed a weapon for the weak that he called Satyagraha. 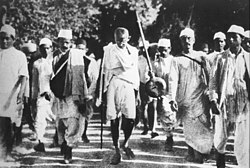 Gandhi conceived of Satyagraha, loosely translated as "Soul Force," as a means of striving for truth and social justice through love, suffering, and conversion of the oppressor. Its tactic is active nonviolent resistance." (McKay 859). ↑ Uma Majmudar (2005). Gandhi's pilgrimage of faith: from darkness to light. SUNY Press. p. 138. ISBN 9780791464052.